This past Spring, PEI Cattle Producers, the PEI Department of Agriculture, Fresh Media and participating restaurants presented the PEI Burger Love campaign where local restaurants were challenged to create the ultimate burger with no rules except that it be made from 100% PEI beef. The general public could then sample (or devour?) 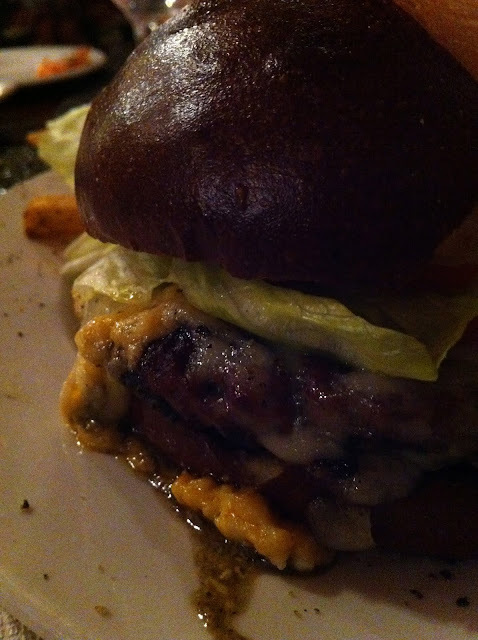 as many burgers as possible, while submitting reviews and voting on their favorites. Unfortunately, we had not yet returned to our native red-soiled land while this was happening and missed our chance to weigh in on the entries and cast a vote. However, fortunately some restaurants are still serving their creations, I assume mostly due to popular demand for these amazing feats of meat. This was one of the co-winners and I certainly concur. 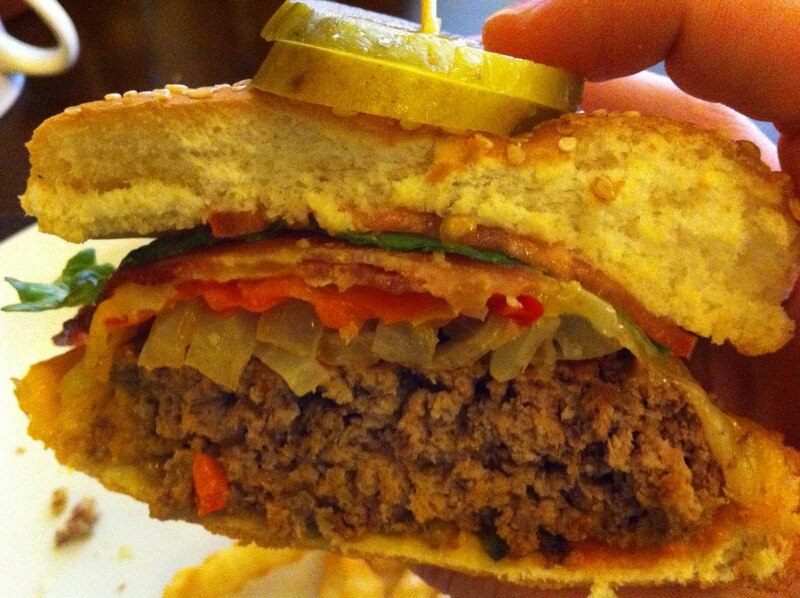 Basically a burger with sushi condiments. Teriyaki glazed, with smoky bacon and pickled ginger as the featured toppings. It was also massive. I've had it twice already and will definitely be back again. The other co-winner. A pretty standard burger topped with a block of cheese, other standard toppings and banana peppers. I can see why it was received so highly because it's an excellent example of a "regular" burger, meaning that there weren't any crazy sauces, spices or toppings used besides the banana peppers... though I'm sure many asked that those be left off. It was designed to be enjoyed by the masses (even the ketchup-only burger lovers) but I'm a little more adventurous and find the other entries much more exciting/appealing. Topped with swiss cheese and a pile of mushrooms, this was a top-notch burger... And I have to say to most amazing part was the crisp pretzel-like bun. I think what I had may be a slightly smaller/toned-down version of what they were serving in the Spring, but none-the-less, it was an excellent burger. Now this was a real treat. A ground pork patty topped with stringy pulled pork pork and a slice of smoked pork belly (aka Über bacon). Hmm... no beef... Well this rogue entry (if it even was an entry?) has nothing to be ashamed of. Even if it got no PEI Burger Love, it gets mine... over and over again... but I digress. Go try it for yourself and you'll understand. All-in-all, I've been impressed so far and look forward to future burger adventures. And who knows, maybe the Iron Donkey slider platter will step into the ring some day against these champions? Rhubarb wine clearing in the carboy. Tastes great so far! Wyeast 1056 - American Ale on the left for an IPA and Wyeast 3463 - Forbidden Fruit on the right for a Belgian Blonde.